Hello hello! I wanted to share a layout I did this week for the August Swirlygirl Challenge over at Swirlydoos (http://swirlydoos.com/news.php). 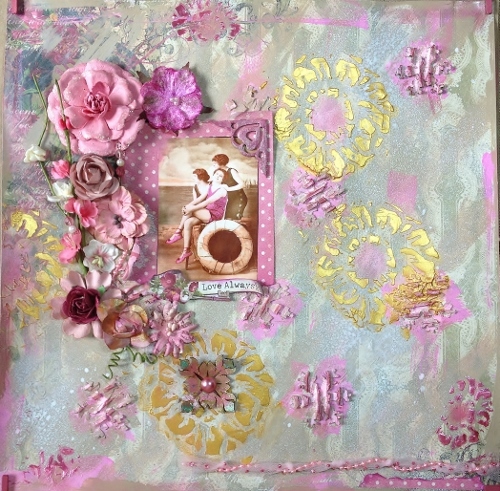 This month’s challenge is hosted by Christy at Creating With The Girls (http://creatingwiththegirls.blogspot.com/). The goal was to take a piece of paper and transform it’s look using whatever you wanted. 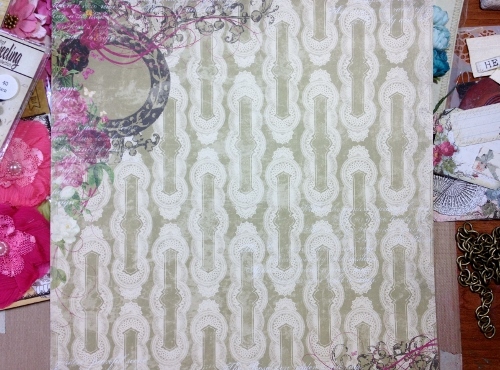 Since I am a fan of mixed-media I pulled things from my bag of tricks…. I recently received some corrugated snowflakes in an RAK from the Funky Junkie Boutique (http://www.thefunkiejunkie.com/) so after gluing those down I continued layering with various and sundry mediums to get to the end result. I am obsessed with pink right now and can’t seem to get enough of it! 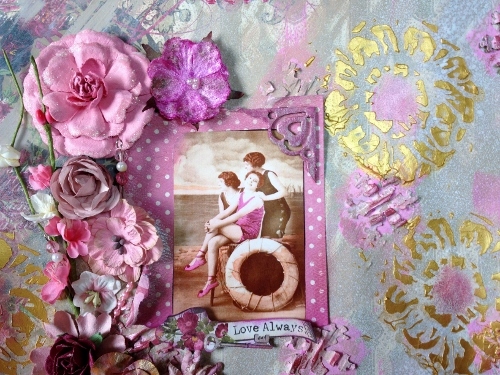 The photo is from a clipart sheet I bought several years ago from ArtChix Studio (http://www.artchixstudio.com/shop/home.php?dir=home). Totally marvelous Katy! That paper sheet is much improved by your artistic hand – love it! Thanks Pauline! I tried to restrain myself because I wanted to be able to still see some of the original paper underneath. Thanks for visiting!